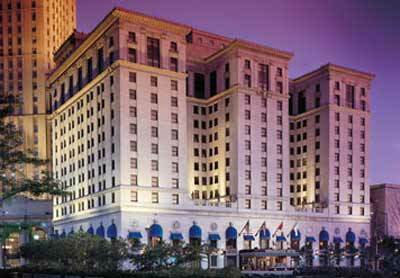 You may remember the Renaissance Cleveland Hotel on Public Square being called Stouffer's Inn on the Square. Maybe you remember when it was called the Hotel Cleveland. The spot has an interesting history as explained in the plaque which is just inside the revolving doors of the Superior entrance. This site has been used for hotel purposes since 1815. Here was erected, first Mowrey's Tavern in 1815. It's name being changed in 1820 to the Cleveland House. Later to the City Hotel. Destroyed by fire in 1845 it was rebuilt in 1848 as the Dunham House. Enlarged in 1852 and named the Forest City House. 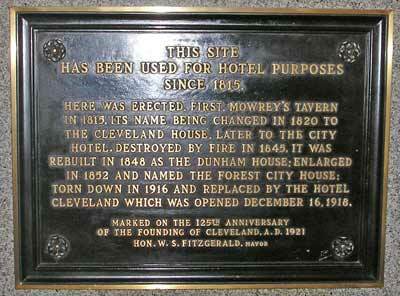 Torn down in 1916 and replaced by the Hotel Cleveland which was opened December 16, 1918. Marked on the 125th anniversary of the founding of Cleveland A.D. 1921. Hon. W.S. Fitzgerald, Mayor.